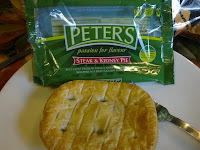 Pierate - Pie Reviews: Do Peter’s put the passion into pie making? It may all seem like a case of déjà vu to our blog fans, but fear not! You’re not getting a repeat review of the same old Peter’s pie – this review is based on the standard Peter’s pie range (as opposed to the slightly more upmarket “Premier” range reviewed earlier this week, as we fail to leave any stone unturned (or should I say pie eaten) in our bid to bring you all the pie ratings you so dearly crave! Taking a look at the packet, there’s one thing that immediately leaps out at you – “Peters – passion for flavour”. What a bold tagline! And with that, I ripped open the packet, slammed the pie on a plate and into the microwave it went for those long 90 seconds of pie heating heaven! But alas, when the pie came out, it didn’t fill me with quite the passion for eating as I had hoped for. 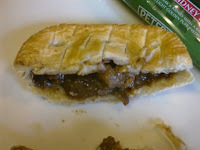 And what certainly didn’t help was the huge piece of steak gristle I found upon splitting the pie in two! Shocking really! And certainly not off to a good start. While I can confirm that the rest of the pie’s contents were nice and meaty, and the gravy was a very nice flavour, I couldn’t help but be slightly downcast after that initial bite. The pie did have quite a nice flavour, when you removed the gristle, but to say that it made me passionate would be a bit of overkill. Overall, the colour was good, though it was a bit chewy and could have had a stronger capacity. Not the cheapest pie I’ve ever purchased, and would rather have the more luxury Premier Peter’s pie option. But alas, this was the only pie left in the local small supermarket! I DONT LIKE DIS! PETER'S PIES ARE DE GREATEST!! !